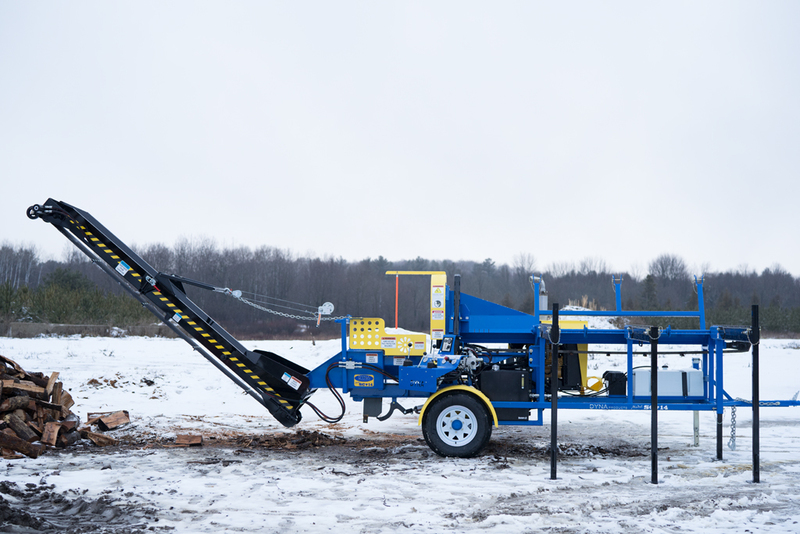 New for 2019 A sawdust chute is now included as a standard feature ! 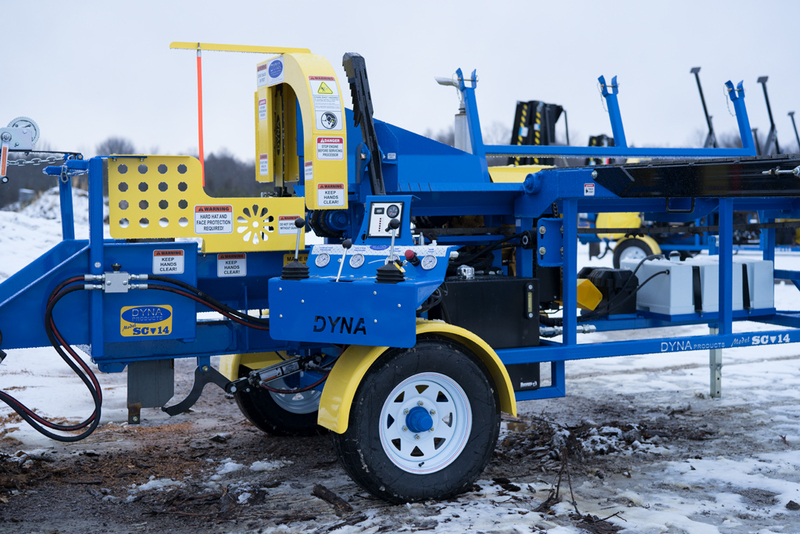 The DYNA SC-14 Firewood Processor is our most popular model, combining reliable, high-output performance with a variety of power plant and configuration options to meet your specific needs. 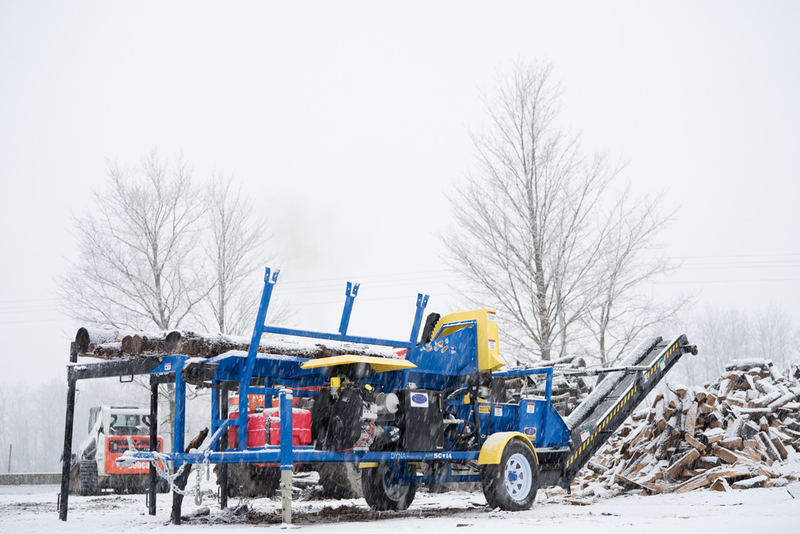 The SC-14 Firewood Processor is simple to operate, with just three hydraulic joystick controls operating the live deck, in feed trough, log clamp, harvester saw, and splitter; all from a single control panel. 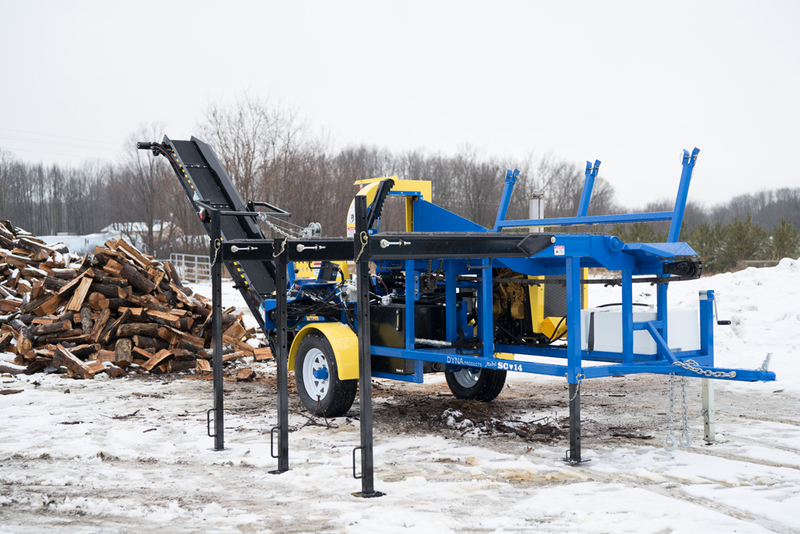 The SC-14 Firewood Processor can be transported easily between your wood yard, your work site, or to rental sites. 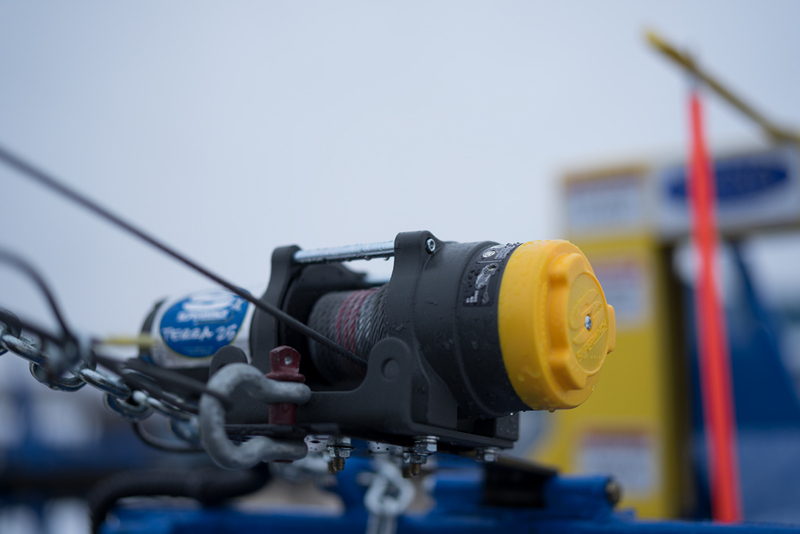 It attaches to a 2” ball, and can be pulled behind any larger pickup truck. 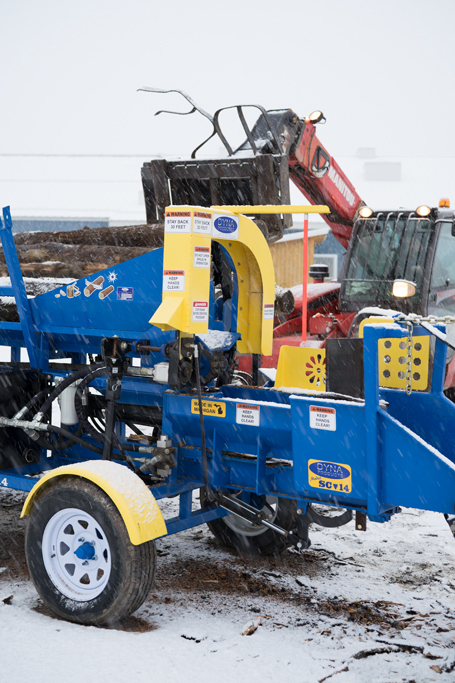 The base model features a 38 HP EFI. 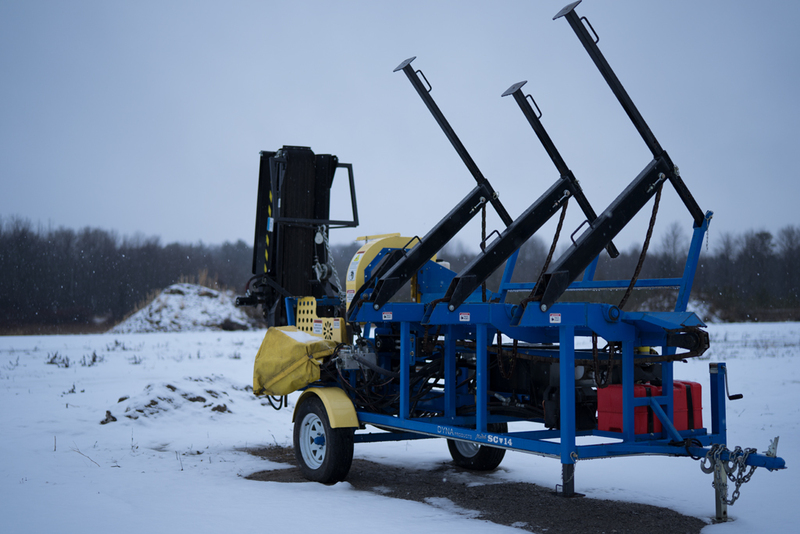 Kohler gas engine, and a 12 Ft. Conveyor. 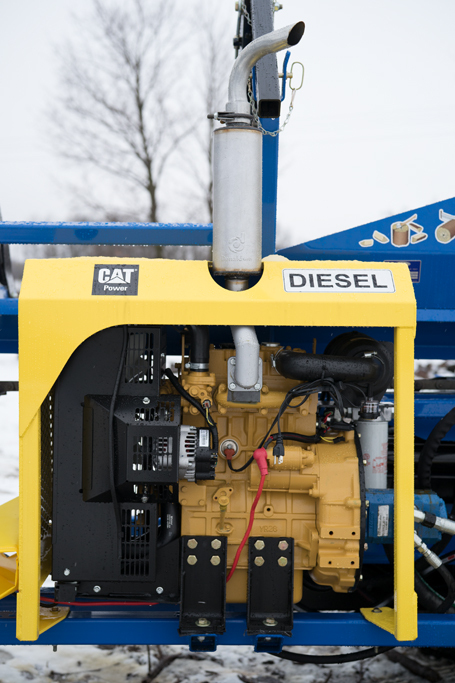 A 40 HP Tier 4 CAT diesel is also an option, as well as a PTO-driven model. 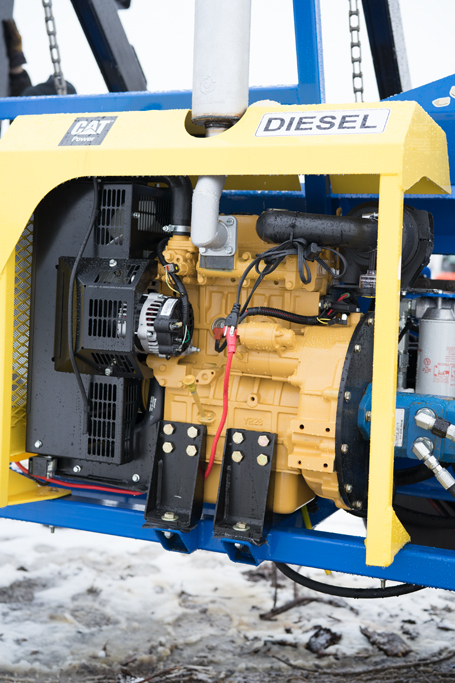 The diesel engine now includes vibration reducing isolators. 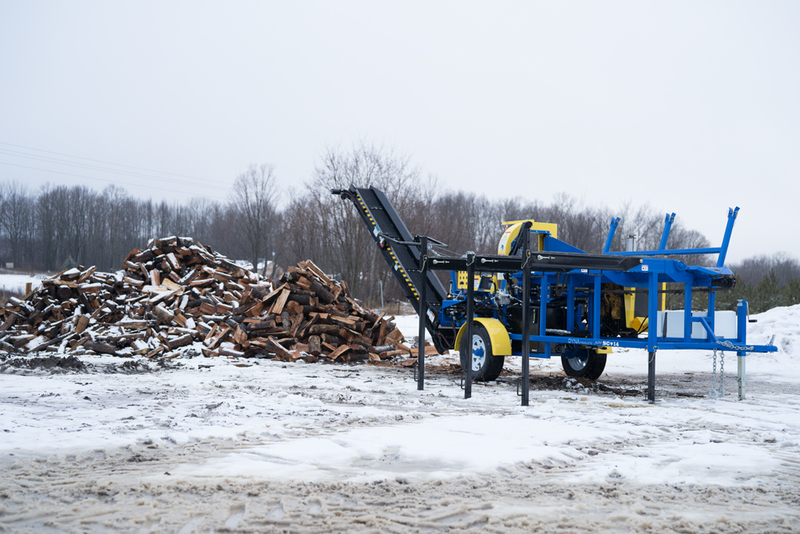 The SC-14 Firewood Processor can process up to 2 cords per hour with a 20” harvester bar and 4” x 24” hydraulic cylinder. 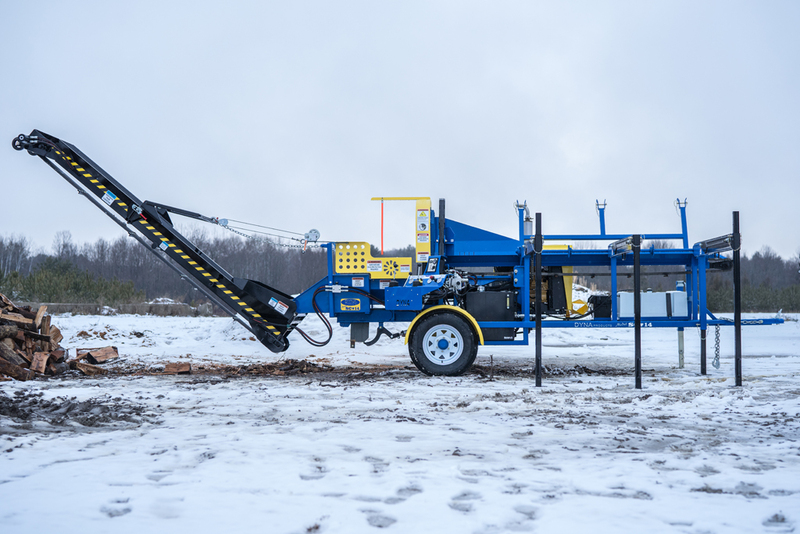 Available with a standard 4-way adjustable wedge (6- and 8-way wedges optional) (8-way bundling wedge limited to 10” diameter logs). 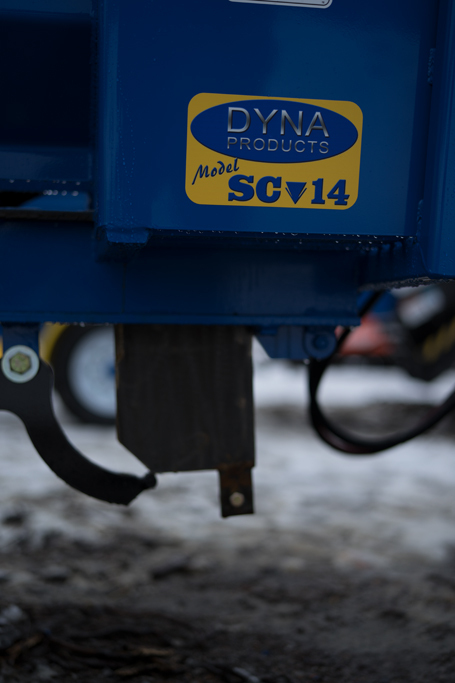 A Hi-Lo Circuit is available on the SC-14 for increased splitter performance and faster cycle times. 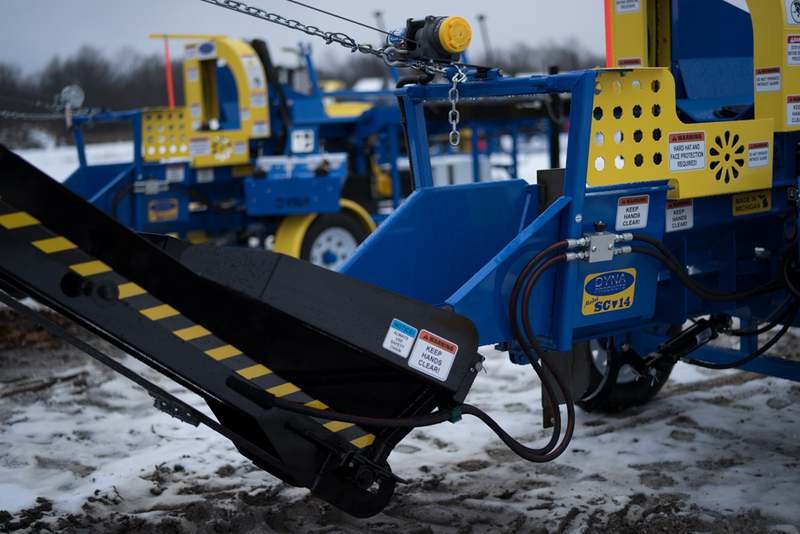 This equipment comes with a 12 month limited warranty. 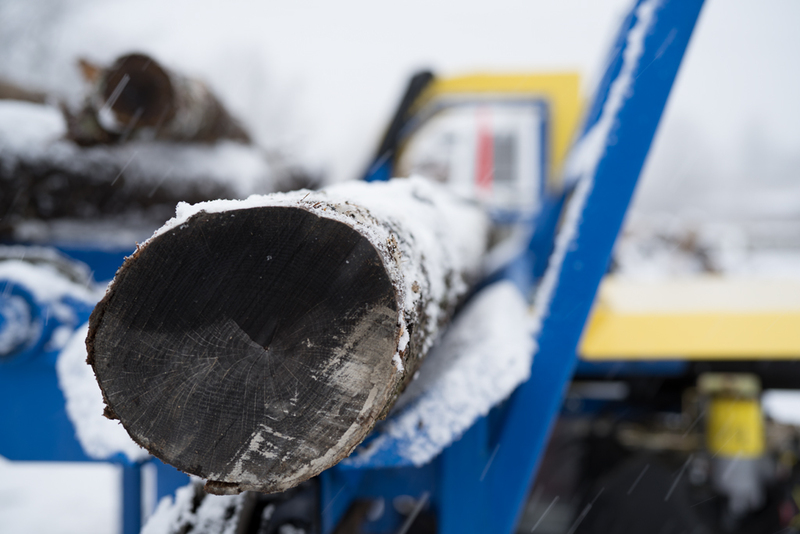 If any product or part is proved to be defective 12 months from the date of purchase, by reason of improper workmanship and/or material we will replace, at our discretion, that part or product at no charge to you. To obtain warranty service, the customer must deliver the part or product to the Factory address at the customer's expense. A copy of the original sales invoice is required when requesting warranty work. 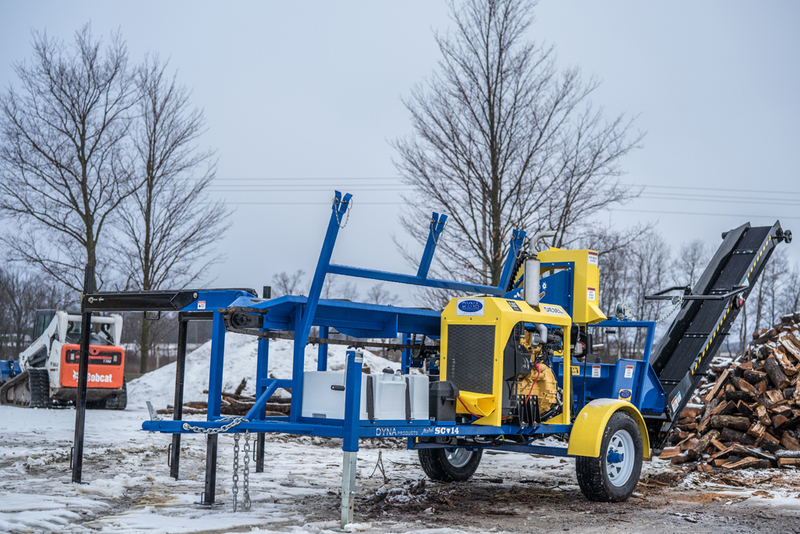 The warranty is limited to 60 days on the saw bar and 90 days on the splitting wedge and the conveyor belt. The saw chain is not covered under this warranty. The Kohler, Kubota, and Honda engines are warrantied separately according to their factory (typically 2-3 years). 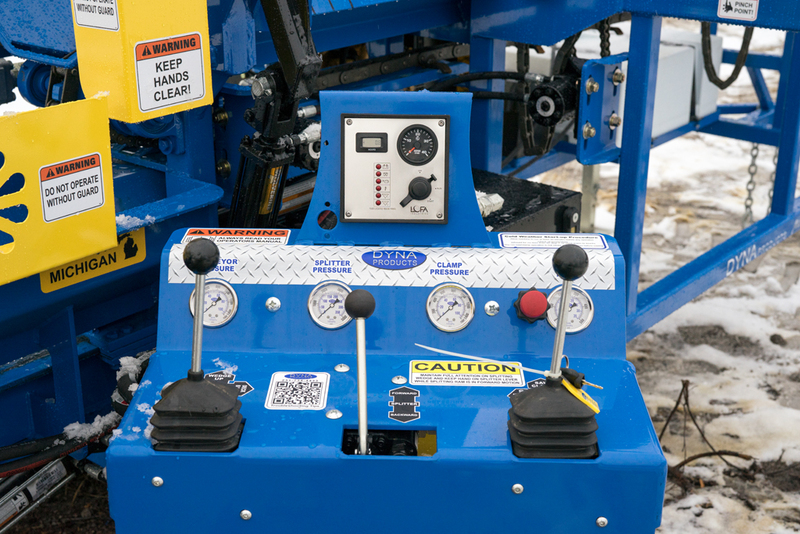 The above warranty does not cover defects caused by modification, alteration, or repair of the part or product in question, by anyone other than the manufacturer, physical abuse to, or misuse of, the product or use or assembly thereof in any manner contrary to the accompanying instructions. 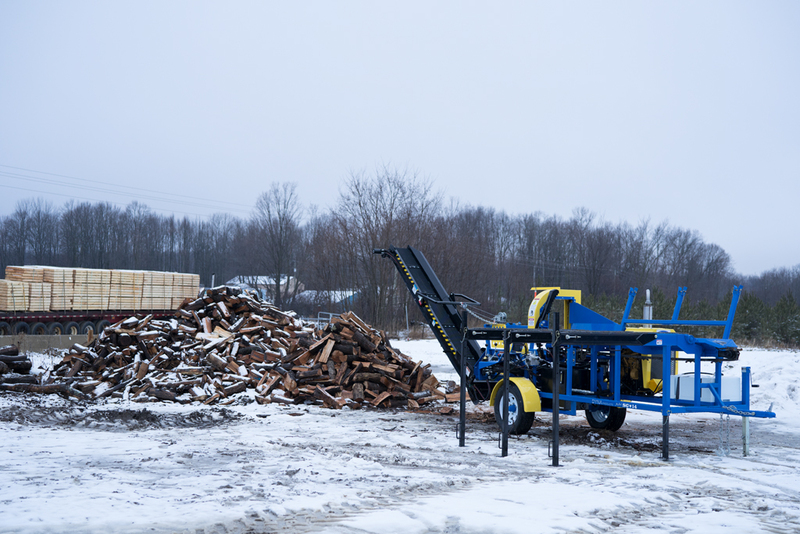 Purchasing a used DYNA Firewood Processor from the Factory? It may come with a 30 day limited warranty. 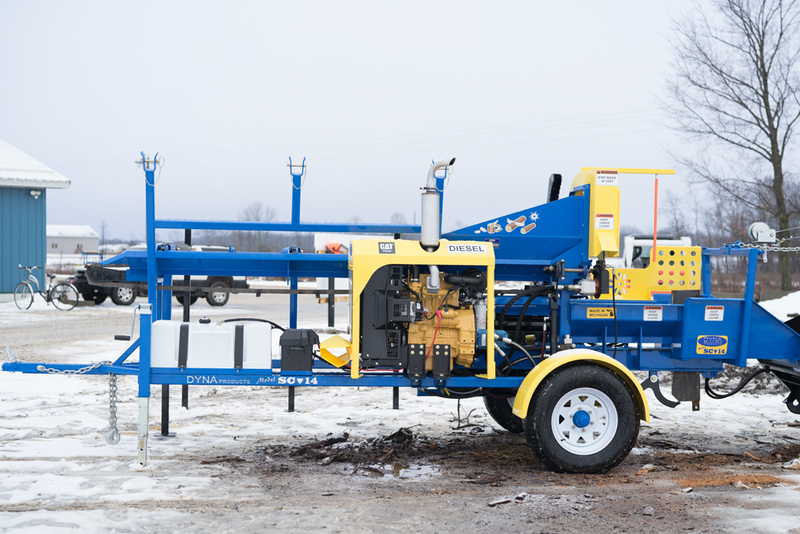 Speak with your sales representative for more details.